Should libertarians abandon the word capitalism? Left-statists (Democrats, socialists) abuse the word capitalism to paint a false picture of those who favor freedom. This has led some libertarians to advocate abandoning the word. But left-statists won’t abandon it. They’ll continue using it in a distorted, pejorative way. Forfeiting won’t gain us anything. Use the word capitalism to expose left-statist hypocrisy! 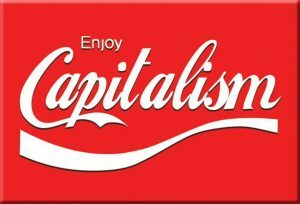 Don’t treat the word capitalism as a synonym for the free market (it isn’t). Don’t wear the word as a label (it’s not a very good one). Do accept the original left-statist perception that capitalism is about owning the means of production (tools, including factories). Use this meaning of the word to point out that most left-statists are also capitalists. A left-statist with a savings account owns capital. A left-statist with an investment account is a part owner of the means of production. Most left-statists have both things. This means that most left-statists are capitalists. Pointing this out will turn the word capitalism against them. It will blunt the sting of their pejorative distortions. 4 Responses to "Should libertarians abandon the word capitalism?" Capitalism as an ideology never actually existed. Markets and trade existed in prehistoric times, transitioning from pure barter to various schemes of credit and debt. Statism evolved from the widespread practice of armed robbery on land and piracy at sea. States offer to regulate trade, as an excuse to gouge a percentage of the goods and services traded, to support the State. Karl Marx and Friedrich Engels conceived a novel form of racism, which held that there existed a superior race of beings called Proletarians, who should take over the world, impose a global dictatorship, and finally regulate markets correctly, so that everyone who can work, does, and the output of all of that work, meets all human needs. This novel form of racism held that the only obstacle to perfect society, were the backward races called the Bourgeois, who make themselves comfortable first before sharing what they have, with others. Marx and Engels defined the word “Capitalism”, to mean the state of affairs that finally forces the true Proletarians to separate themselves from the Bourgeois and wage global war upon the Bourgeois, seizing control of the means of production. Of course, what’s absurd about Marx and Engels ideology, is all of it. Taken together as a package, the entire idea assumes that somehow from the wreckage of global war, peace will magically result. Since this magical event never happened before, in the wreckage left over from smaller wars, there was absolutely no reason to think that a bigger war would somehow do the trick. However, why let facts interfere with a perfectly-enjoyable self-delusion? The entire planet has indulged in a series of racial purifications, ethnic cleansings, and other genocides, seeking to rid Humanity of the traits that cause Bourgeois-ness. The effort accomplished zilch. The trouble with the Marxian idea package, is that it begins by assuming that our individual thought-processes are insignificant, and that everything a society does, happens in spite of what’s in the minds of most of that society’s members, not because of their thoughts, wants, and acts. Force is needed, to impose order upon those scattered, disparate, random individual thoughts, so that each person can be regimented and organized into work teams to perform the needed work, believed the Marxians. Effectively, Marx saw evidence of Voluntaryism around him everywhere, but refused to believe what his eyes and his ears were telling him, about the Voluntaryist nature of human beings and our interactions with other human beings. Ordinary human family life depends on Voluntaryism. Friendship depends on Voluntaryism. Force is a rare thing, and not a common thing. Perhaps he was too stubborn to notice that his ideas stunk, too. I like that Michael. I also like the use of the word “one,” because there are obviously many other consequences of non-aggression, just as there are many aspects of the free market besides the accumulation and use of capital. This fits nicely with one of the points I’ve been trying to make. Capitalism is not a synonym for the free market, it is merely one aspect of the free market. There are many more. Hi Perry. Thx again for all the thoughtful posts!